The Fast Diet is built around the concept of intermittent fasting. Michael Mosley, the books author, wanted to see if all the health claims made about the benefits of intermittent fasting were true. He put himself on The Fast Diet as a investigative experiment for his BBC documentary, Horizon: Eat, Fast, and Live Longer. He claims that eating this way caused him to lose weight and keep it off, while improving his overall health. The basis of The Fast Diet revolves around the 5:2 eating plan. This involves eating normally 5 days per week and fasting 2 days per week. During the two fasting days, women should consume no more than 500 calories each day and men should consume no more than 600 calories. The calories can be consumed all at once or split up. Mosley split his calories into two meals consisting of 250 calories for breakfast and 350 calories for supper. The Fast Diet provides dieters with 40 fasting day meal recipes that are easy to make and includes pictures of what the meals should look like. It doesn’t matter which days of the week a person fasts as long as 2 days are devoted to this practice. A picture of a 500 calorie meal from the book. 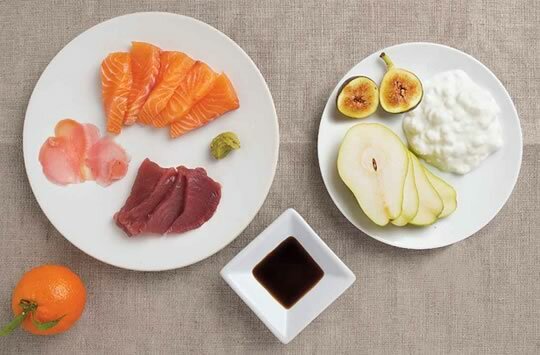 During the 5 normal days of The Fast Diet, it’s important that dieters eat in moderation and are encouraged to eat healthy. There are no forbidden foods, but dieters shouldn’t eat more calories than they are using for the day. The book includes a calorie calculator so that dieters can accurately set their normal day calorie amounts, which varies according to gender, weight and height. Michael Mosley believes most diets fail because people don’t do well with restrictive diets. Therefore, The Fast Diet is all about calories. Healthy foods are encouraged, but are not necessary to experience the benefits of intermittent fasting. Dieters are encouraged to be active, but exercise isn’t emphasized in The Fast Diet. Strenuous exercise should be avoided during fasting days. 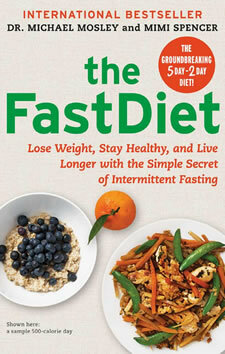 There are no other expenses related to The Fast Diet other than the cost of the book which retails for $24.00. However, dieters may want to visit their doctor for blood tests prior to starting the diet to establish a health profile baseline. The concept behind of The Fast Diet has been around for some time, however, because of Michael Mosley’s media connections he has been able to document and publicize his version quite well. The fasting days will be difficult for some, especially during the first several weeks until the body adjusts to this new way of eating. Hopefully further research will continue to support the health benefits many attribute to this diet.